There’s something to be said for the simple solution. On the road I was on a campaign to “look three times, think twice, paint once.” Here in this simple cottage I’m trying to think a bit and paint simply. Specifics? Prime with a middle or dominant tone so that a lot of the work is already painted. Put a wet medium on the surface. It seems to lubricate the mind as well as the support. Pay attention to order. Reversing habitual order speeds process, increases joy, improves freshness. Rethink each work so it functions within the confines of the new subject. Every work requires original thinking. Look everywhere to improve efficiency, expediency, facility. I promise not to labor when “elan” will be just fine. Work into a tender mode. Know that it is some sort of simple love. Stroke beautifully, directly, honestly. Do not be impressed with how long it took to do something. Badness often takes a long time to accomplish. Esoterica: Medieval scholastic philosopher William of Occam (c.1349) was imprisoned for various thoughts, among them the idea that simpler solutions are preferable to complex ones. Simple solutions also have the advantage of “rightness,” he said. This philosophical concept is called “Occam’s Razor” and can be used for cutting up canvasses. This morning… I love reading and thinking about simplicity… just the basic bare bones, the beauty… I too spent the winter in an old old house… post office… general store, no water, heat off and on… everything in chaos… and trying to make sense of why I chose to come here… it was hard… and just now when things are bursting with life, beauty, colour… that was what I most missed, the colour… the bleakness, cold, hard winter… oh it was mean… but yesterday the water went again… so this morning I must go out to the river with my yellow Home Hardware pails… just when I was grinning how easy it was… to live with things working… I haven’t painted since coming here in November… I am renovating… making it ready for an art retreat beginning in two weeks… I have just cleared and cleaned out the huge store space… today I paint the floors and the bulk of the work will be done just in time for a great summer of workshops here in Dunedin. I live on the West Coast of Scotland so I can relate quite easily to old cottages and peat fires. Paintings which includes a thatched cottage with peat smoke coming out the chimney seem to strike a chord with most people. I think everyone gets tired of characterless modern buildings and love a bit of nostalgia. Myself, I must say that I love the old stone cottages found in Ireland and Scotland — ye canny whack ’em. I wish we had adhered to more often over the years to your “keep it simple” message as today we have been going through more “stuff” and trying to get rid of it. I can’t believe all the “stuff” we have — where did it all come from, why have we kept it so long, and “did we need this?” People have a way of making the simple life very complicated — perhaps we all have too much time to sit around and think up these things. Since computers, for example, I thought life was to be simpler — now that is a joke. We were going to do away with lots of paper use when the computer came along — well if you could see my office, that theory has gone out of the window. WE are doing away with more paper for sure — but not the way it was intended — we are using more and more of it. That’s the way we will eventually do away with all the world’s trees. All feelings and experiences originate from someplace. Trying to analyze the how’s and why’s is a compulsion that, as far as painting is concerned, never seems to get us as far as we think it should! 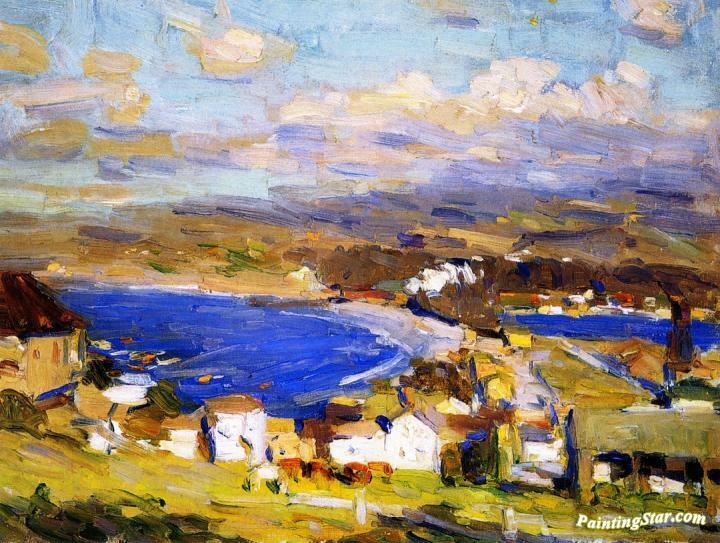 On a painting trip to California recently, I saw a 12×16 inch painting ” Monterey Bay” by Euphemia Charlton Fortune. It wasn’t detailed and did not have a “strong center of interest” etc. What it did have was a simple, full of life quality that spanked my senses! It probably never won awards or created a stir, but that little spur of the moment oil sketch changed the way I see. It was surrounded by Masters of California Impressionism that I barely noticed! I borrowed many useful tidbits from that room full of paintings but I never could quite figure out “how” she did it or “why” it affected me the way it did. Absolutely a good reason for cutting up canvasses is that compositions have become too complex and jumpy. There is no focus or unity and the work has “too many notes.” I have taken to heart some of the ideas that were stated in the letter and responses in The Big Picture, which came recently. To me this is the ultimate of simplicity. The quote from Oscar Wilde interested me. It implied the possibility that simple pleasures might be the refuge of complex people, and brought to mind the letter by Diane Voyentzie in the last responses regarding the painting pastime of Winston Churchill. I think that art and particularly painting offer some calming and centering influence that may not be had with other activities. Painting’s deceptively simple, yes, but it also requires a kind of multi-level knowledge and technique which may provide a therapy that otherwise busy and complex people need. A remarkably small set of materials, a few pencils, tubes of Japanese watercolors, several blocks of Russian papers, water from a rusty pump, all set in motion by the sound of somebody’s ticking clock and the strange noises of the enveloping forest, time to fill as a child would fill the time, drifting along lines of undiscovered imagination, dining, reading between, and beautiful dreaming sleep. I was out earlier this evening, with a friend, talking around subjects that newly acquainted people talk around. I write for magazines. Tomorrow is my deadline and I just couldn’t seem to get a line on it so I went out. I had been thinking about how I would find a way into my story and just like that… there you were. I can’t put my finger on the precise quality that inspired me to carry on. Perhaps it was simply the lines, “Rethink each work so it functions within the confines of the new subject. Every work requires original thinking.” Whatever it was, I feel grateful for the sudden inspiration and I wanted to thank you for sharing your fire tonight. You may be interested to know that artists from 86 countries have visited these sites since January 1, 2001. That includes Judy Walton of Texas, who recommends Tera Leigh’s tole making. And also Ruairi MacChomascaigh (yep) of Dublin who is “artist of the month” at www.artirish.com. And Colm Quinlan of County Donegal who says he has no choice but to be simple.